Great post. Thanks for starting this discussion. I met Bruce Peters a few weeks ago and have also been blown away by his insights Beyond Teal. At the end of the blog post above it’s mentioned that in Teal, “hierarchy still exists, but not where you may have historically found it.” Being a fan of Laloux’s book and Teal practitioner myself, I see Teal hierarchies in two ways. First, there is the hierarchy that connects the varying levels of purpose. For example, the individuals intrinsic purpose, to the teams collective purpose, and perhaps to the organizations externally focused purpose. Purpose is what aligns and connects the work of many unique individuals. Second, there is the Teal notion of Self Management. In a self-managed team, the notion of hierarchy seems to lose it’s meaning. Or does it? There is another Teal principle called Wholeness, where individuals are valued for their uniquely valuable contribution, while all people are seen as having equal worth (i.e. nobody has authoritative power over anyone else). That being said, there is nothing wrong with a self-managed team autonomously deciding to implement a hierarchical structure. For example, many Teal companies have “teams of teams” that set the company vision or strategy. In another example, a Teal team may decide to implement decision makers for different types of decisions. I’m curious to know, is this the way others see hierarchy in Teal? What else may there be to ground the Teal principles for individuals who are having trouble understanding the world from this advanced perspective? Great introduction to the Teal concepts and to Bruce, my friend and mentor for many years! Like Hayden, I’m intrigued by your hidden hierarchy tease. Another way of looking at the self-management aspect of a Teal organization might be that everyone on the team has (or can grow) the capacity to lead some part of the team’s goals. I’m thinking of the story I read about in Shawn Achor’s Big Potential that you may be familiar with. He tells how the conductor in the Boston Philharmonic helped the eleventh chair violinist become both a leader and a better musician by seeking her input on how he should conduct a particularly challenging piece — and then adopting her suggestion for the public performance. Leadership can run up, down, and sideways; and should adapt to the changing situation, no? In this schema, Is there a definition provided for “self-directed” and an argument provided that “self-directed” is the ideal goal that “people with authority” should be striving for? Thanks the series of posts, Tom. Can I take it that from the fact that you are providing effort into this investigation means that you think the book is worth reading because it provides significant insight or a perspective of importance? Thank you for your posting and the questions you asked. I am rarely challenged on my insistence and purity of the tenets of Requisite Organization, however, occasionally someone raises their hand and says “Yes, but, what about this ____ ?” You fill in the blank. The most aggressive challenges are from those who espouse self-organized, self-managed, manager-less teams. The challenge has been formalized most notably by enthusiasts of Holocracy and Teal. In those schema, there is immediate and universal condemnation for “hierarchy,” with the anti-dote being manager-less, self-directed teams. I am a firm believer in hierarchy as an observed model of effective organizational behavior, so I am taking a thoughtful and measured approach to these alternative structures. My approach, though, contains an unwavering bias toward hierarchy, so my inspection lens is certainly tinted. If you are a student of organizational design, you have to read about such approaches, including Tony Hseih’s Delivering Happiness and Frederic Laloux’s Reinventing Organizations. I do not refer these to be followed blindly but as a discovery process to understand something through a different lens. In some cases, like today’s blog post, I find the description misses the reality of what is actually occurring and mis-attributes the outcome to an unrelated cause (fundamental attribution error in cause and effect). It’s not my purpose to condemn the thinking, but rather to understand more completely what is happening (through the lens of Requisite Organization). I applaud you for investigating this on in a sober and meaningful way from an RO or more generally “scientific” (i.e., rational, reasonable) perspective. 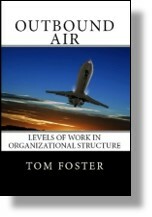 I don’t live day-to-day in the organizational design world although I have used RO principles and techniques to design aspects of organizations (structure follows strategy, and roles must align to the required work). Every time I read about holocracy or some other variant of attempted non-hierarchical design, I can’t but think that too much is missing in the description, starting with who and why is someone paying for work to be done in the organization, and what results are they aiming for. As Walt Disney said, someone has to make the decisions. I’m with you that these example help to see things from an alternative perspective and are important to understand and investigate in order to remain objective and to “understand something fhrough a different lens.” They can show where the hierarchy is hidden, likely in plain view. My shallow reading on holocracy seems to indicate that when pressed many of the advocates accept that there is “hierarchy” of accountabilities; they just draw it in circles to deny it is hierarchy. Keep up the good work and the thinking and the writing. I appreciate it, even when I don’t comment on everything, as Im sure other readers of your blog do as well.